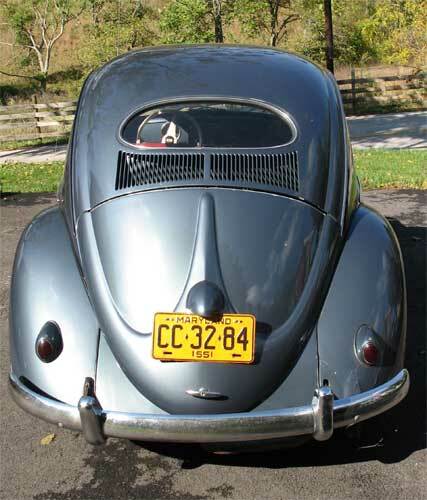 The Beetle in the 1950's was not the common sight it became in the 1960's and 1970's. In the 1950's Americans were used to cars with miles of chrome and tons of steel. The Beetle easily disappeared in the shadow of those cars. There were few companies producing small cars for the U.S. market in the 1950's; Crosley (yes, the folks who made the refrigerators), and American Bantam were a couple. But these cars were more suited for the lanes of perhaps England than the long highways of the United States and they did not sell well. Beetle sales did not start off well in the U.S. market. 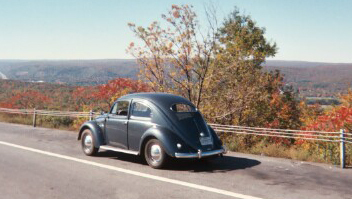 In 1950 Max Hoffman of New York received sole distribution rights to Volkswagens on the east coast of the U.S. Mr. Hoffman sold VW's alongside Porsches and a variety of other European upscale automobiles. Since VW's were more of a sideline Hoffman did not manage to sell the amount of cars that VW wanted. One year Hoffman and his distributors only sold 390 VW's, and in 1952 they managed a whopping 690. Heinz Nordhoff, Director of Volkswagen, decided to make a change and Hoffman's contract was not renewed. In 1954 VW sent representatives to the United States to supervise and organize distribution. The reorganization had an effect and perhaps Americans were also more willing to accept this small car. 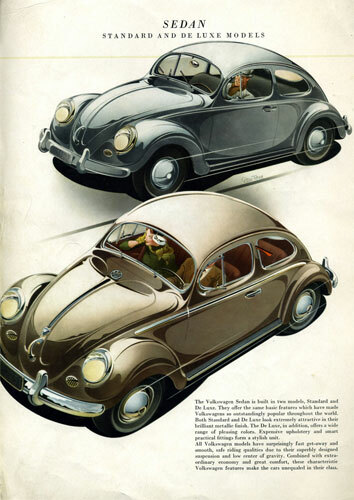 In 1954 6,614 VW's were sold in the U.S..
1955 was a year of changes and milestones. VW decided to align its model years with American model years. Thus the 1955 model was only produced from January 1, 1955 through July 31st. Then in August the 1956 model was introduced. The 1956 model had alterations for the U.S. market. New "towel rack" bumpers with chrome bars were added perhaps in an attempt to protect against much larger American behemoths. The vehicle also received fender mounted turn signals as Americans did not understand semaphores. 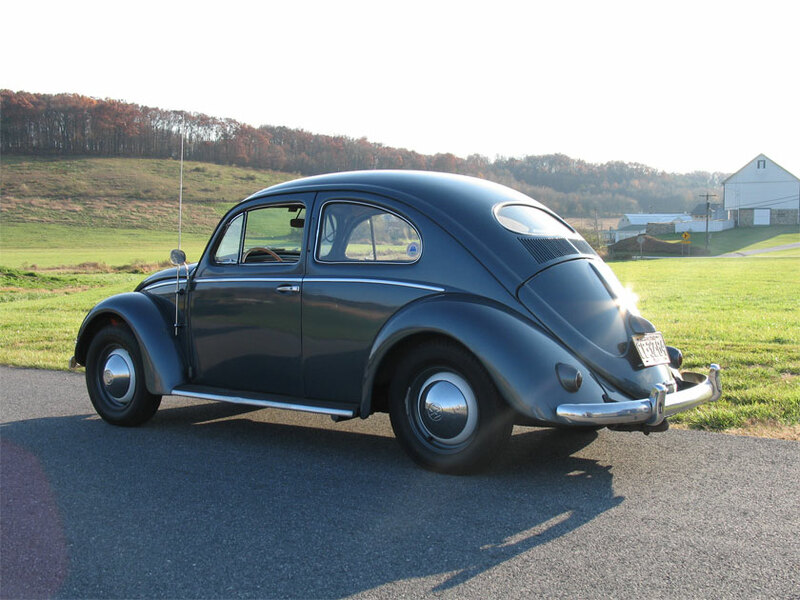 1955 was the year VW turned out its millionth Beetle. There was a massive celebration at the Volkswagen factory and VW also built a special gold painted Beetle with rhinestone bumpers. This was sent on tour of various dealerships. Finally representatives of Volkswagen set up Volkswagen United States to oversee distribution of cars and parts. VW performed much better in 1955 with 30,928 vehicles sold in the U.S..
We are awaiting the birth certificate for our car from Wolfsburg so I cannot give it's exact date of construction and delivery yet. Suffice to say it is an early 1955 model. Thus it is basically a 1954 model minus the heart tail lights. Our car retains the semaphores and earlier style bumpers. It spent the majority of its life in the New England area as far as I can tell. The last owner told me that it sat for years in a barn on Cape Cod and was finally rescued and restored in the 1990's. After that it passed through a couple owners and the last one put it up for sale after finding a much coveted 1955 sunroof model. 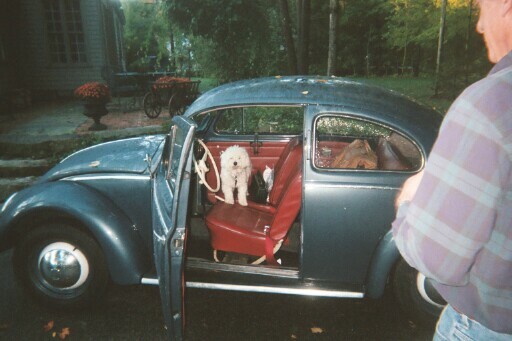 My ex wife and I saw our car in June 2003 when we were in Massachusetts for my sister's wedding. The car was about a half a mile from my parents house. We had owned a series of VW Beetles and had been without one for a few years. The stratos silver 1955 tugged at our hearts but we left it there. My parents test drove the car as my father had once owned a similar bug, he did not purchase it either. Eventually that autumn I called up my father and asked if the little bug was still sitting down the street. It so happened that the bug had sold on ebay and then never been picked up. So, I sent money to Massachusetts, and went North in October to pick up the car. I helped my parents with their house for the weekend in between test driving the car locally. The last owner had regularly driven it all over New England for car shows so we were not too worried about reliability. On a sad note the car has an updated 1600 engine (I would prefer the earlier 36hp). But I will say that I felt much better driving through the mountains of New York and Pennsylvania with the more powerful engine. I drove the car home Columbus Day 2003. I started early in the morning with a full tank and a new set of tools. The dog stayed at my parents though he wanted to go for a ride. I had not driven a bug from New England to Maryland since the mid nineties so this was going to be an experience. The car performed well with only one minor malfunction on the way. In Pennsylvania the starter stopped working. I could not remember all the handy dandy tricks I had picked up years before (like climbing under and shorting it with a screwdriver); so I just push started it when I needed to on the rest of the trip. The bug developed quite a cult following on the trip South. It took me nearly an hour to get out of the gas station in one Pennsylvania town. Every person and their neighbor seemed to have owned an oval bug at one point, and they all came out to see it and give me pointers. Unfortunately that delay forced me to arrive in Maryland after dark giving me a chance to enjoy the soft glow of 6 volt headlights on the last stretch home. I always am impressed when a fifty year old car can happily drive ten hours and seem ready to go for more. Since 2003 the car has served me well. It has electrical issues like an English car, but so far that seems to be the result of a very amateur wiring attempt. There was even lamp cord in part of the car!! As I update this page I cannot believe I have owned this little car for 7 years. A fun and informative website. Nice site featuring a '53 Oval and a '49 split. A wide variety of rare and hard to find items. Semaphore parts included. Matt does some of the best semaphore restoration. Reproduction parts and restoration services for early Beetles. Many rare and hard to find parts for early Beetles. knowledgeable and a joy to do business with. I could not recommend BBT more. These folks come recommended. They carry parts for early Beetles.